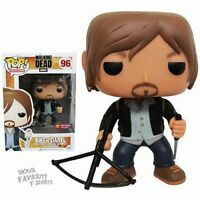 Walking Dead Funko Pop! Vinyl Daryl Dixon's Chopper #08 Dixon FREE USA SHIPPING! Received it just minutes ago! Looks great!! Appreciate the quick turnaround! Thanks! It is a cool item, looks just like Norman from the show. Was happy to get this one when I did because it seems to be going up in value online. BLOODY DARYL DIXON!!! Love it! Love it when they do the blood splattered Walking Dead exclusives!! Awesome = Better than expected! Mint condition! Good item for someone not into the gory details. I purchased this version of Daryl because the box shows blood splatter on his face. When you have the box in your hand, you can't really tell there is blood splatter on his face at all.